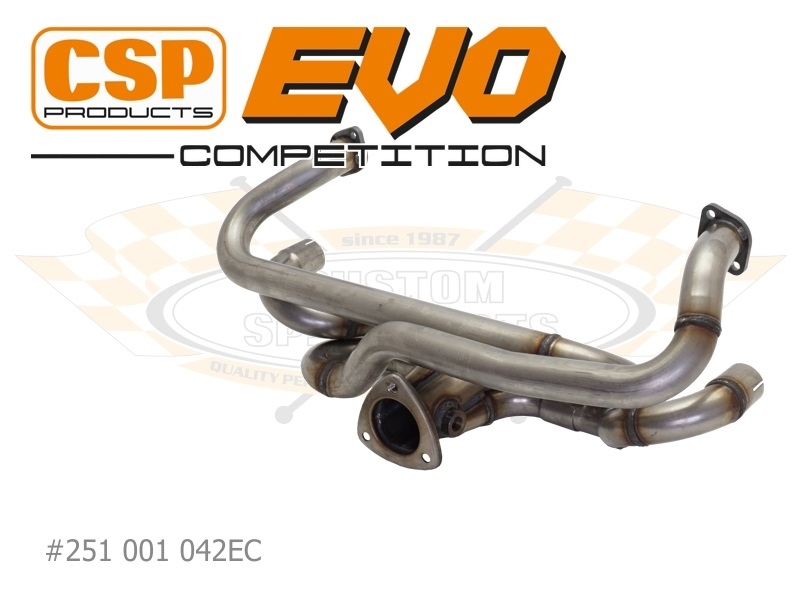 The CSP Products Evolution Competition is a subtle high performance stainless steel exhaust system for your Beetle or Ghia. Besides the two stainless steel tailpipes with 54 mm diameter, everything else tucks neatley under the car. Two versions (38 mm and 42 mm) are available and suit Type 1 engines from 1600 cc onwards. Because of the very clever design the CSP Products Evolution Competition is suitable for very low vehicles as well. 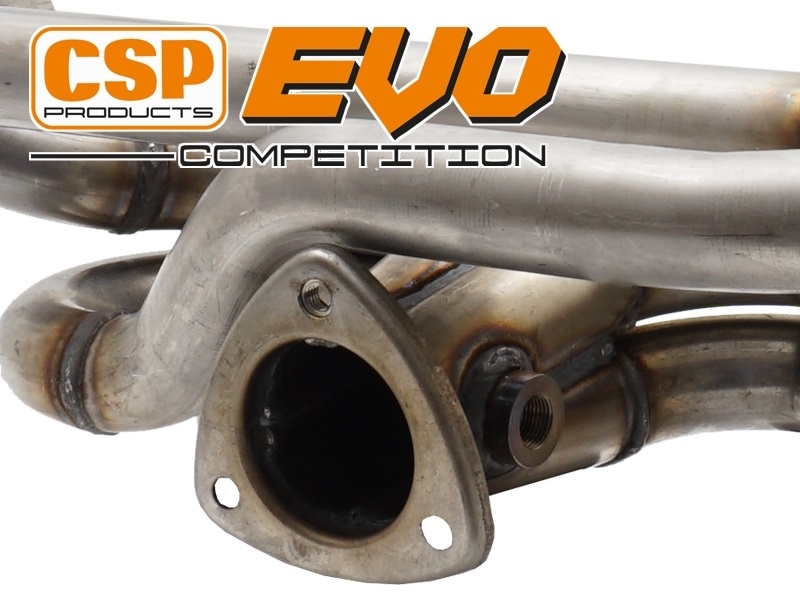 During development the revolutionary CSP Products Wasp exhaust acted as a model for this new system. That’s why the large, painstakingly manufactured collector corresponds to the one from the CSP Products Wasp system and also features movable header pipes. Because of this, the collector flange is always centered, even on stroker engines. Internally the collector forms a pyramidal shape for optimum flow patterns and maximum gas velocity, which improve the torque curve all the way up to peak horsepower and beyond. It also features equal length tubes and an oxygen sensor socket. The stainless steel absorption silencers, specially manufactured for CSP Products, provide the system with a deep, sporting sound, and an unobstructed path for the exhaust gases into the atmosphere. Both mufflers are polished and bear the CSP Products logo. 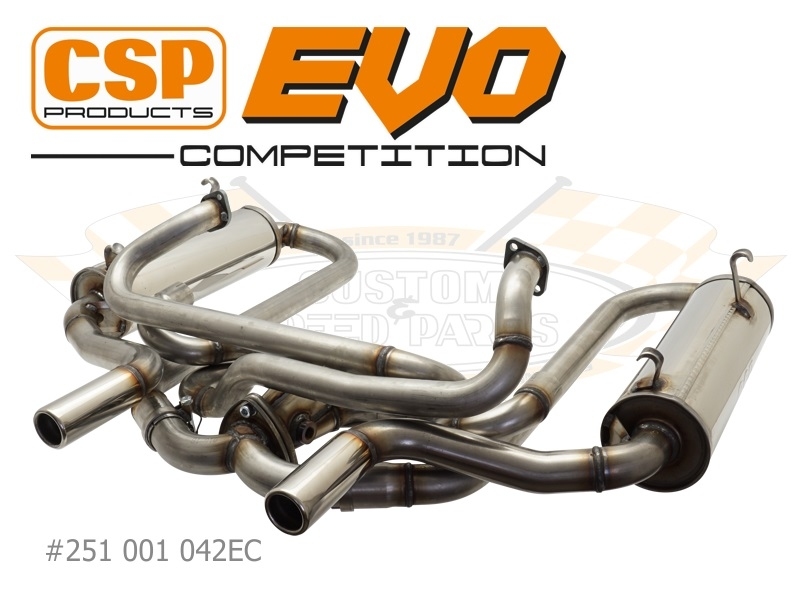 And just like our other sport exhausts the CSP Products Evolution Competition still allows the use of heat exchangers.